Give the gift of good eating! Straub's Gift Cards are great gifts that everyone enjoys. Let them choose between our famous chicken salad, our USDA prime steaks, a fine bottle of wine, or a chef prepared meal. 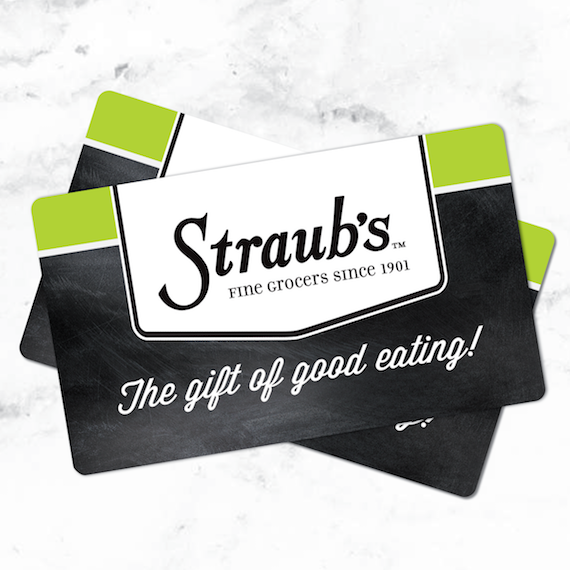 A Straub's gift card makes a welcome surprise for the holidays. It allows the recipient to make her own choices and have treats at home. I am formerly from St. Louis now living in Greece. However when I want to send gifts to friends and family in St. Louis, I always order from Straub's. The best food market in St. Louis! I ordered a gift card that was delayed by USPS delivery and Straub's was kind enough to quickly send a replacement that arrived just in time for the holidays. I really appreciated their genuine interest in helping me. Great idea for gifts for the holidays ! Best present and so practical.